Belize NMS: Generally fair and cool. 24-hour forecast: Variably cloudy with isolated showers or periods of light rain especially over the north. General Outlook: For Wed. and Wed. night is for gnerally fair weather with isolated showers. Today E 10-20 kts Moderate-Rough 5-7 ft ISOLATED SHOWERS OR PERIODS OF LIGHT RAIN. Tonight E-SE 10-20 kts Moderate-Rough 5-7 ft ISOLATED SHOWERS. Outlook E-SE 10-20 kts Moderate 4-6 ft ISOLATED SHOWERS. As of 22/0900 UTC, a cold front extends from the Windward Passage near 20N73W to W Jamaica near 18N78W. The front becomes stationary from 18N78W to E Honduras near 15N84W. Scattered showers are within 120 nm of the front N of 16N and E of 82W. 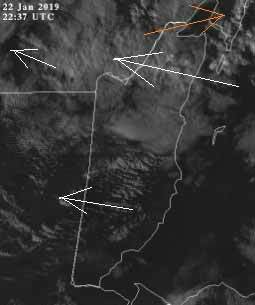 Isolated showers are near and within 120 nm NW of the front. 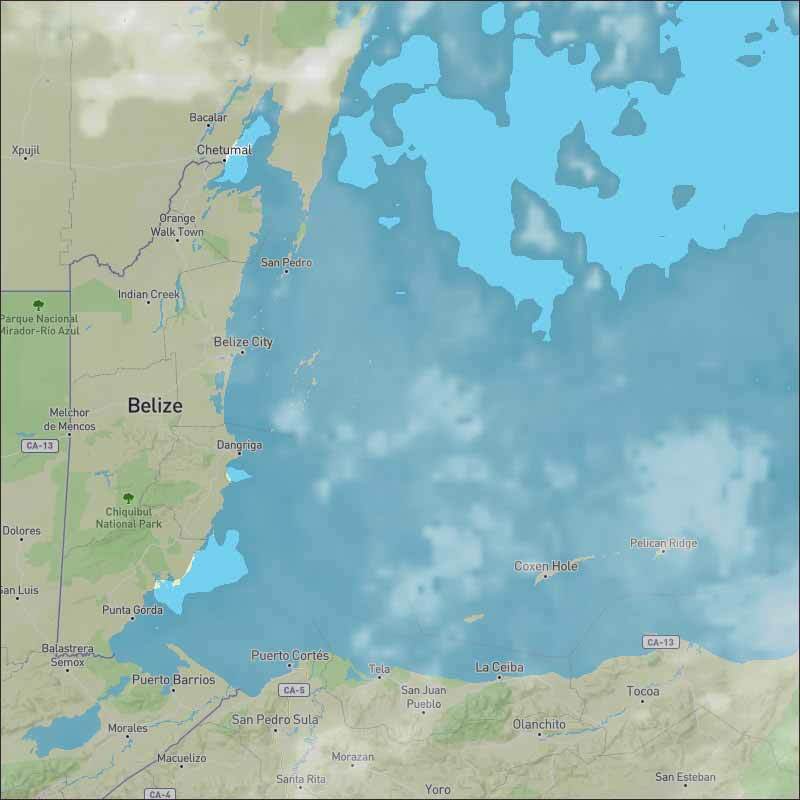 Fresh to strong NE winds prevail within 240 nm NW of the front, with moderate to fresh winds closer to the Yucatan Channel. Only typical isolated trade wind showers are noted over the Leeward Islands and Puerto Rico. A stalled and weakening frontal boundary from the Windward Passage to eastern Honduras will dissipate today. Strong high pressure north of the area behind the front will maintain strong NE winds over much of the Caribbean through mid week, with gales pulsing off Colombia. Winds and seas will diminish late in the week as the high pressure shifts east ahead of another cold front expected to move into the northwest Caribbean by late Thu. The second front will stall then dissipate from central Cuba to central Honduras by late Fri. 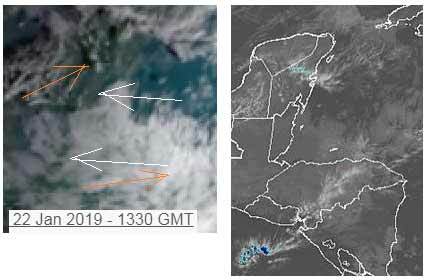 Looking ahead, a third front will enter the northwest Caribbean Sun and reach from western Cuba to the Gulf of Honduras Sun night. Farther east, NW swell will move into Atlc waters off the Leeward Islands by Wed night. On Ambergris Caye this morning we have rain and a heavy overcast sky with a breeze from the East. The high temperature for today is in the upper 70's. Last edited by elbert; 01/23/19 05:01 AM. The easterly Caribbean cloud is firmly in control again, but no surface wind, just cool air. The high level clouds from the SW are thin, but the Caribbean wind is full of blanket cloud, covering most of the country at present. There was a very small trace of rain last night, out at sea, but none at present, but the Caribbean cloud does have some heavy ridges in it. 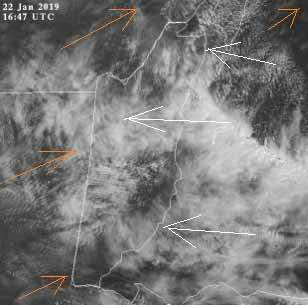 Looks as if today will be mainly cloudy for much of the morning, getting thinner as the day progresses, little or no rain expected, but it is right on the edge of possible rain. 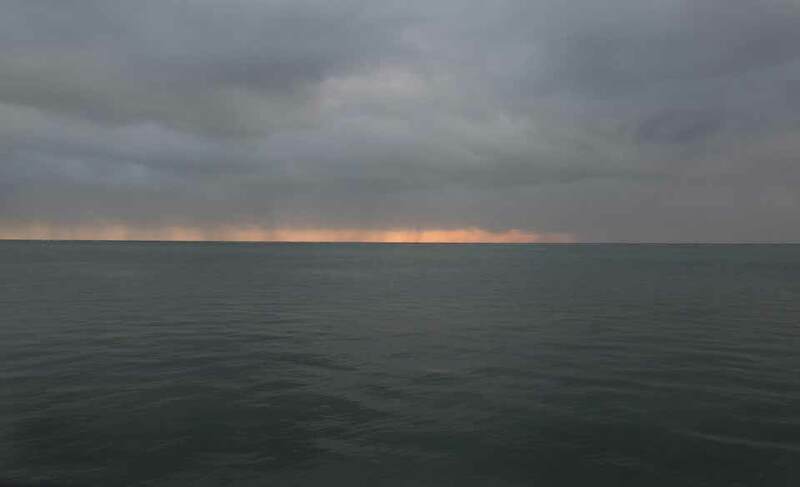 The Cloud picture, no rain, little drizzle out at sea. The high level cloud is still there, but appears to get thin in the evening. There has been some warm air pushing up from the south during the day. There is a lot of cloud in the Caribbean coming our way. Looks as if tomorrow will be fairly cloudy again. Not much sign of rain just yet.